RIDA has been developing and investing in commercial real estate projects in Houston, Dallas, and throughout Texas since 1972. Its developments have closely followed the RIDA philosophy of project development based solely on economic viability. As a result, RIDA has been able to create and invest in innovative and economically successful Texas office and retail developments for the past 40 years. Anticipating the opportunities created by Florida's rapid growth, in 1985 RIDA opened its division in Orlando, Florida. As opposed to Texas' milder governmental regulation policy, Florida's municipalities are keenly involved in all areas and phases of the developmental process. This mandates the need for the painstaking attention to detail and excellence that only an experienced and savvy development group can successfully provide. As is highlighted in the ensuing pages, RIDA's projects have earned it a reputation as one of Florida's leading multi-disciplined developers, and is today considered one of the finest hotel development groups in the Southern United States. RIDA has developed an outstanding portfolio of well-planned, high profile, and financially sound commercial and residential Florida real estate. In 2015 as part of its $800 million development of Gaylord Rockies RIDA opened its western regional office in Aurora, CO. RIDA has recently acquired 120 acres around the Gaylord Rockies for a planned $500 million mixed use development over the next decade. In 1992, David Mitzner made an important revisit to his native Poland, his first in more than forty years, eventually establishing a real estate operation there. In 1995, he acquired his first two office buildings in Warsaw, becoming among the first American real estate companies to do business in Poland. Two years later, in 1997, Mitzner established a partnership between RIDA and Ares Management of New York - formerly known as Apollo Real Estate Advisors - to purchase, develop, and manage commercial real estate in Poland. Since that time, RIDA has developed numerous commercial developments in the office, industrial and retail sectors. 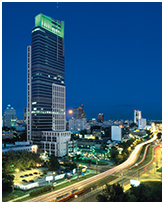 Landmark projects developed and invested in include Ericcson Center, Par Tower, Renaissance Tower, Zeran Park I and II, and the tallest building in Central Europe, the Warsaw Trade Tower. In 2004, Mr. Mitzner's company Apollo-RIDA Poland completed the largest real estate acquisition in Central Europe's history, the $1 billion purchase of the Metro anchored shopping center portfolio. As RIDA has become one of the most well known and successful real estate groups in Central Europe, it has extended its activities to include a major presence in Germany, the Ukraine and Russia.